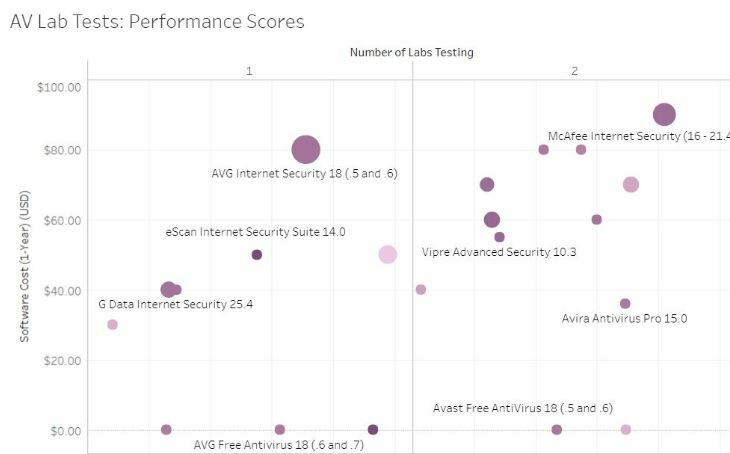 Using independent antivirus lab test results and website review scores, we charted and compared top AV tools based on multiple points, including overall protection, system performance, false positives, price, and more. There are currently dozens of antivirus tools available on the market. Big name options such as Norton, McAfee, Bitdefender, and AVG typically get the most headlines and the most attention. But are the top-branded tools on the market truly the best? Unfortunately, parsing through the many different lab tests, consumer reviews, and other data can be time-consuming. Even more so, comparing each available service against the other ones is not a simple task. Thankfully, we’ve taken on a large bit of the hard work for you! Using currently available data from recent independent testing labs, pricing data, and consumer review site scores, we’ve developed simple tools that will help you quickly and easily compare over available 50 antivirus tools. Our tools offer a completely unbiased approach to finding the best antivirus software for the price. This way, you know you’re not getting sold a product that could be ineffective at finding and removing malware from your system. If you’re looking for a quick and easy reference guide, use this table to look up the software you may be interested in purchasing, or to compare different software based on certain, important criteria, such as price. Use the following tool to compare antivirus tools based on protection (how effectively they identify malware), performance (how efficiently they run on your computer), and false positives (how often they incorrectly identify safe programs as viruses). You can also filter for price, and by how many device installations you’ll get for the lowest price possible. There are multiple ways you can use this tool. First, you can filter by aggregated protection, performance, or false positive scores. Simply click the box for that name. Each tool is organized based on how many independent labs have a recent test for that software. For example, Avast Free Antivirus 18 is the only tool to have been tested by all 5 independent testing labs from whose data we collected. All software available in the data is colored by the aggregated scores they received (0-100, with 100 being a perfect score). Each point in the chart is sized by how many device installs you get for the minimum purchase price. Use the filters on the right side look up specific tools by name, or to filter based on the minimum number of devices with 1-year purchase, annual subscription price (if any), the number of independent labs testing each program, and by the average score for that category. For example, if you want an antivirus program that has a protection score of at least 90 percent, has been tested by at least 4 testing labs, and costs no more than $50 dollars per year, you’ll find Avast Free AntiVirus 18 is the perfect tool to use. If you own a personal or work computer or any other device that connects to the internet, you need antivirus. Bad actors online are regularly using and improving their methods to infect computers. That includes through phishing emails and websites, infected downloads (including through popular social media sites like Facebook), and even from USB devices, such as flash drives. According to G-Data, a new malware variant is detected online every 4.2 seconds. There were nearly 8 million known computer viruses in 2017, as well. The longer you have a computer and the more websites you access and emails you receive, the greater your chances of getting a virus infection. With millions of viruses floating around the web, it ultimately becomes a question of not if you’ll get a computer virus, but when you’ll get one. Computer infections cannot only cripple your work and be costly to remove, but they can also steal valuable data. And many viruses are designed to hide on your computer, quietly recording your keystrokes, passwords, and more. Alternatively, ransomware, which is designed to lock you out of your computer and demands payment to be removed, is among the fastest-growing types of malware. All computer users should consider installing at least a free, third-party antivirus tool. At present, most operating systems come with a free tool pre-installed, but you should also consider purchasing or downloading a separate application. Our data suggest that the programs included in most operating systems are not nearly as effective. The single best solution to stopping a malware infection is to use an antivirus program. These tools continuously scan your computer or mobile device and your web browser, looking for known viruses and anything that looks and acts like a virus. When a suspected virus is detected, the tool will automatically quarantine it, preventing it from infecting your device. You will then get a message that gives you the option to either delete the file if it’s a virus or release it if it was a false positive. If you’re installing an antivirus tool on a device that’s already infected, you can also use the tool to scan the device and remove any pre-existing malware or other infections. Although Mac users should also consider getting an antivirus tool, Windows users, in particular, have the greatest need. Over 99 percent of malware that exists were specifically designed to infect Windows computers. This does not mean that Windows computers are inherently more vulnerable than Mac computers. However, the prevalence of viruses impacting Windows computers means that as a Windows user, you are simply more likely to run into a virus at some point while browsing the web or using your email. One of the biggest threats for Mac users is complacency. Although most viruses that exist were designed for Windows computers, Mac computers are still susceptible to getting virus infections. Notably, there are far fewer antivirus programs that exist for Mac computers, mostly because of the far lower number of Mac computers and fewer number of viruses impacting Mac computers. As a result, our research only focuses on Windows computers. Still, you can find a review of top Mac antivirus programs here. There’s an on-going debate in the Linux community about whether or not antivirus is necessary for this operating system. The argument is essentially the same as with Mac users. Because there are fewer Linux users, there are also far fewer viruses attacking Linux operating systems. However, we’ve found that Linux computers can and do get viruses. You can find out more here in our study on Linux viruses. Viruses on mobile devices are far less common, but they do exist. Among the mobile device world, the situation is similar to Windows vs. Mac. If you have an Android device, you are extremely susceptible to getting a virus infection, especially from malicious app downloads. According to mobile cybersecurity company Lookout, phishing is among the biggest threats facing mobile users. Importantly, many mobile users are not prepared to stop phishing attempts, which increasingly come in the form of spam text messages. Many of the antivirus tools we cover in our data provide mobile tools. However, there are also many tools available specifically for Android and iOS devices. Each lab maintains different rating standards and methods. For example, AV-Test creates a score out of 6 for each category. Meanwhile, AV-Comparatives assigns a score out of 100 for Protection, but uses the raw number of False Positives instead of creating a score. Additionally, not every lab tested all of the same AV tools, and some, like MRG Effitas, did not test for all three categories (MRG Effitas only offers Protection results). To account for these differences, we took averages and made adjustments to equalize their ratings. We also created our charts to differentiate by how many lab tests each AV software appeared in. Furthermore, we added extra filters to help consumers identify which tools might be the best value. For that, we included a minimum purchase price, the number of devices allowed for the purchase, and an average score based on other consumer review sites, where available. There are a few interesting takeaways from the data that may interest consumers. All others received aggregated scores of 90/100 or better. This means consumers’ best option is to consider more carefully the other areas of value: Performance, False Positives, Price, and the number of devices allowed per purchase. Ahnlab is not available to consumers, however, and while Panda Free Antivirus scored well in performance, its false positives score was extremely subpar. That makes eScan Internet Security Suite the best in this category. Four testing labs used False Positives as a measure for testing. Not every tool showed up in every lab test, however, and we had to make some adjustments particularly for AV-Comparatives, which did not create an average score for that category but instead offered only gave a raw number (e.g., the total number of false positives each tool sent back). eScan comes out on top in this category as well, although both Vipre and AVG performed noticeably better in the Protection category, whereas eScan scored a perfect 100 Performance and False Positives. It should be noted, however, that the only other tool to get a perfect 100 in two categories was AVG Internet Security, which scored 100s in both Protection and False Positives. Quite obviously, most consumers prefer a free tool versus a paid one. And indeed, many of the free tools on the market are high-quality options worth considering. Consumers may also want to consider using Microsoft Windows Defender, which comes loaded with any new installation of Windows, or Panda Antivirus Free. Those two tools score well in the Protection and Performance categories, but poorly in False Positives. As far as low-cost options, however, there are a few stand-out AV tools that may offer great value and quality, while there are some notable exceptions that are far too pricey for what they deliver. Beyond these, most services cost $50/year or more, and indeed, the services with the best test results are also ultimately among the most expensive. eScan is the only exception, making it one of the best-paid options based on its positive test results. Other available tools may still be worth the price when consumers take into consideration other features. Individual investigation of those features may be prudent before making a final decision based on price. Those looking to cover multiple devices may be better served with one of these options, all of which have good test results as well.